18 high quality frosted LED globe bulbs from Philips, the warm light given off is perfect for furthering a warm homely atmosphere. Compatible with all B22 Bayonet fittings which can hold a A60 globe bulb; these bulbs perfectly match the colour temperature of traditional incandescent bulbs, while using only a fraction of the energy. Add warmth and nostalgia to living areas. These Philips LED light-bulbs provide a beautiful warm white light, an exceptionally long life and immediate significant energy savings. With a pure and elegant design, this bulb is the ideal replacement for traditional bulbs. What colour of LED light should I choose? It depends: Warm White is soft and warm, ideal for living spaces, dining areas, and any other place where a relaxed and comfortable atmosphere is preferred. Daylight White is more similar to how daylight looks, ideally suited for personal working spaces, offices, and retail shops. Are these LED bulbs dimmable? NO, this LED model is NOT dimmable. Please check out the dimmable version of this product Philips Dimmable 6W B22 Bayonet LED! 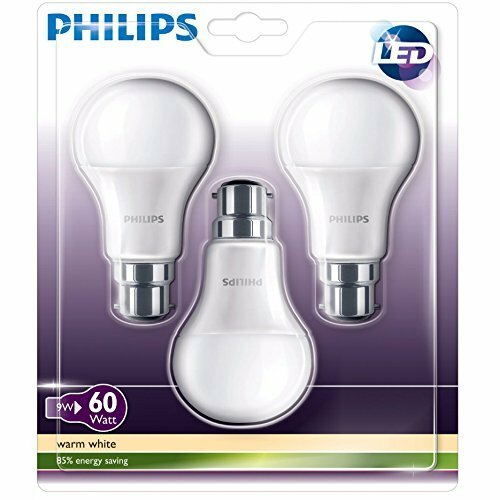 These Philips Brand LED bulbs come brand new in retail boxes, with 2 years manufacturer warranty.